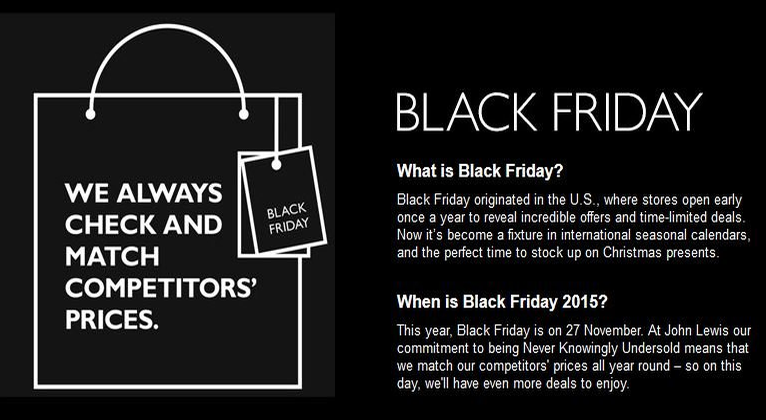 John Lewis has confirmed that its Black Friday deals will be bigger than ever this year. What? Wasn’t it John Lewis that warned last January about Black Friday going too far? It certainly was but it seems the company’s new “We Love BF” stance is all about its Never Knowingly Undersold (NKU) commitment that sees it matching other physical and digital store deals. MD Andy Street, while praising Asda’s “bravery” for opting out this year, said “we cannot stand aside, we will not blink over that NKU commitment.” Now some might say that John Lewis is blinking like crazy in the grand old game of nerves between retailers and their customers. But the fact is that the seven days around Black Friday last year was John Lewis’s biggest shopping week EVER and we have to assume that it didn’t damage sales and profits further on in the season. So, what will we get from the chain and its website come November 27? And will it be enough to beat the company’s record Black Friday 2014? The company isn’t saying just yet but it has promised its deals will be bigger and better than last year. That’s significant because a new report from LCP has shown that a third of major retail names saying Black Friday is unsustainable and dents profits but it’s the firms who mess up deliveries who will lose out as they can put customers off and damage longer-term sales prospects. With its extra investment, John Lewis is making sure it’s not in that group and hopes to be one of the retailers making UK Black Friday sales break through the £1bn barrier for the first time this year.